The tour covers the modern city centre with its natural silhouette, the colourful city market, Parliament buildings, Kenyatta International Conference Centre, the landmark of Nairobi (KICC), the Railway Museum and the renowned National Museum where there are spell-binding displays of the early man, tribal regalia and flora and fauna of Kenya. A visit to the adjacent snake park is also included. The tour returns to your city hotel in time for lunch (lunch excluded). This tour departs daily at 0200 hrs. This unique wildlife sanctuary is just a few kilometres from Nairobi's bustling city centre, with Nairobi boasting of having the only wildlife sanctuary to be found in the city precincts in the world. Despite its proximity over 50 species of mammals can be found there, including four of the Big Five with elephant species not being represented. The tour also includes a visit to the animal orphanage at the park gate. The tour returns to the city centre by sundown. Private tour of the same can be organized in the morning for a minimum of 4 pax in a group. 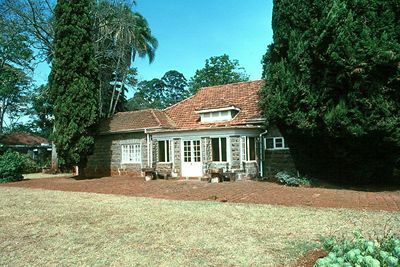 Drive towards the Ngong Hills and pass the Ngong village to the Karen Blixen Museum, for many years was her home. Later proceed to the Giraffe Centre to see and hand feed the famous endangered species of Rothschild Giraffe and her family. Guaranteed daily departures at 12.30 p.m. and 7.00p.m. Nairobi has many restaurants offering varieties of cuisine. We recommend dinner or lunch at the Carnivore, which is famous for the succulent stew and barbecue dishes of game meat as an excellent compliment to a holiday in Kenya; especially as an excellent welcome, or farewell dinner in Kenya. Bomas is a homestead and just 10 kilometres from the city centre with numerous homesteads reflecting Kenya�s cocktail of cultures depicting in a traditional village life style. You will be treated to a rich traditional music and dance show at this cultural centre. The greatest excitement is the display of traditional dances, music, and songs being performed in a splendid area. Traditional dishes may be served as extras. Lake Nakuru lies in the volcano strewn Great Rift Valley. Enjoy the view of the Great Rift Valley from the escarpments and then descend to the Lake Nakuru National Park. A game drive to view spectacular thousands of flamingos and other bird species in addition to viewing the white and black Rhino, Leopard, Buffalo and Waterbuck among others. Lunch is served at either Sarova Lion Hill Lodge or Lake Nakuru Lodge. A stop over will be made at Lake Naivasha, time permitting. This package involves visit to the wildlife sanctuary located just a few kilometres from the city centre and a combination of Bomas for cultural displays, dances, and songs. Lunch will be served at Nairobi Mamba Village, giving you a chance to watch crocodiles feeding, ostrich farm, camel and horse riding. The tour returns to the city centre in the evening. Fourteen falls is located about 65 km away from Nairobi off Thika - Garissa Road turning at Makutano junction. The falls derive the name from their fourteen successive falls of water along the famous Athi River, border between Thika and Machakos districts. There is a lot to see and do while in this scenic site � boating, fishing, photography, plant identification, bird watching among other activities. Nearby the falls lies Kilimambogo, a Kiswahili word for the Mountain of the Buffalo and home to the late Great Philanthropist Sir Macmillan. Half way the hill lie his grave, that of his wife and their house helper. It is on the foot of this hill that Macmillan entertained Roosevelt and Churchill when they paid him a courtesy call. In the hill you will spot birds, buffalo, baboons, and other animals. Picnic lunch will be served at the hill summit. Return to Nairobi where the tour ends. Drive to the largest picnic site in Kenya (54 acres of pure fun). This is the home of the 2.5 years old stone age caves, trees thought to be hundred of years old while the river reeds have a long story to tell. Enjoy the nature trails amid bird watching, horse riding, camel riding, feeding Maasai ostrich, fishing, coffee farms, and boat riding. The tour returns to the city centre. Utamanduni is a Kiswahili word for �traditional� and forms a full day of pure Kenyan traditional cultural experience with visits to utamanduni cultural centre displaying a variety of cultural activities. Traditional dishes will be served to enable clients have a total true taste of traditional Kenya. Drive 6 km from the city centre to Ngong Forest, the only indigenous forest in the world that is located right within the city confines of a capital city. The forest is a 600 hectares of urban forest managed by a private charitable trust � The Ngong Forest Sanctuary Trust. The walk in the forest offers bird watching, plant identification, and animal life accompanied by a professional naturalist. At the end of the walk Ngong Race course Restaurant will serve refreshments. Please note your payments go to the Ngong Forest Sanctuary Trust, contributing to conservation of this highly valued natural resource splendours. Depart Nairobi city driving westwards stopping at the viewpoint on the Great Rift Valley to view the Loita plains and the sparkling Lake Naivasha in the thousands of feet below. Proceed to Lake Naivasha (the highest lake in the Great Rift Valley). The lake is famous for the staging of Imperial Airways Flying Boat Services from Durban to London in the 1930�s. Optional boat ride at the Crescent Island is available at the lake. Bird watching and plant study by the lakeside will be compelling. Mt. Longonot is one of the volcanic mountains of the Great Rift Valley of geological importance. The tour returns to Nairobi in the evening. Depart Nairobi and drive south through Maasai territory via Namanga on Kenya-Tanzania border and on to Amboseli, at the foot of Mt. Kilimanjaro, Africa�s highest snow capped mountain in the tropics. Excellent game viewing will be witnessed with high concentration of elephants with bulls having the largest tusks in Kenya. You will have the chance to see lion, rhino, giraffe, zebra, impala, wildebeest, buffalo amidst other animals and plentiful of birds life. Lunch will be served. Afternoon game viewing followed by departure for a journey back to Nairobi arriving in the evening.